This article is about Chip from Disney Castle. You may be looking for Chip from Beast's Castle. One of the kingdom's specialists. Helps maintain the gummi ship, which can travel to any destination. Chip is more serious and diligent than his easygoing, playful partner, Dale. Chip 'n' Dale's first appearance was in "Private Pluto" (1943). One of the kingdom's specialists. Helps maintain the gummi ship, which can travel to any destination. Compared to the more serious Chip, he takes a happy-go-lucky approach to life. One of the kingdom's mechanical specialists. He helps maintain the Gummi Ship, which can travel to any destination. Chip is diligent and follows through on his plans. Chip looks almost exactly like his pal Dale, but you can tell them apart by the color of their noses and the shape of their front teeth. One of the kingdom's mechanical specialists. He helps maintain the Gummi Ship, which can travel to any destination. Dale's pretty impulsive, but he works slow and steady to finish a job when it's important. Dale looks almost exactly like his pal Chip, but you can tell them apart by the color of their noses and the shape of their front teeth. He and his younger brother Dale put a lot of work into building a racetrack for the whole town to enjoy, and now the Unversed and Pete's antics are ruining all the fun. Chip is none too pleased. He and his older brother Chip just got through building a racetrack for everyone to enjoy. But now, the Unversed and Pete are messing everything up, and it's really rattling Dale's cage. One of the engineers working at Disney Castle. Dale is his little brother. On Sora's previous journeys, they were in charge of the Gummi Ship, a flying machine which allowed Sora and friends to freely travel between worlds. He and Dale look a lot alike, but you can tell the pair apart by their nose colors and the shape of their front teeth. One of the engineers working at Disney castle. Chip is his older brother. They are superb technicians, and now they have put on their system admin hats to digitize the journal and find out what's happening inside. He and Chip are sometimes hard to tell apart, but their nose colors and the shape of their front teeth are a dead giveaway. One of Disney Castle's engineers. Serious and professional, his skills with machinery are top class. He invented the gummi ship and Gummiphone together with his younger brother Dale. One of Disney Castle's engineers. Despite his laid-back personality, his skills with machinery are top class. He invented the gummi ship and Gummiphone together with his older brother Chip. "It's your favorite Gummi engineers here, ready for duty: Chip..."
Chip and Dale are a pair of chipmunks. They reside in Disney Castle as operators of the Gummi Ship, and appear in Kingdom Hearts and Kingdom Hearts II. They are almost identical but can be identified easily—Chip has a black nose and one bucked tooth, while Dale has a red nose, two bucked teeth, and scruffy hair on the top of his head. Chip and Dale appeared in Disney Town hearing the conversation between Terra and Queen Minnie. They tell Terra that Pete is playing unfairly in the Raceway game and ask him to help. After Terra wins and beats Pete, they both offer their votes to Terra, in hopes that he would win the Dream Festival. Chip and Dale are present when Aqua wins the Million Dreams Award. They encourage her to try out the ice cream and wonder what it tastes like. Chip and Dale can also be fought in Fruitball. Chip and Dale send Donald, Goofy and Pluto off to Traverse Town. When Sora obtains the Gummi Ship, they help explain how traveling to other worlds works. They also announce events like when a new competition is being held at Olympus Coliseum. After Ansem is defeated, they encourage Minnie and Daisy to look at Huey, Dewey, and Louie and the Enchanted Brooms. Chip and Dale appear in Disney Castle, warning the visitors of the invasion of Heartless in the castle, and are present to witness the salvation of it after Merlin sent the trio back in time to prevent the past from changing. They also contact the trio when a strange universal reading appears in their radar, eventually the reading is turned out to be The World That Never Was. They are also present when Mickey Mouse, Donald, Goofy, Scrooge McDuck, Pluto, Jiminy Cricket and Donald's nephews return to the castle together. Both Chip and Dale appear as the engineers of the computer when Mickey, Donald, Goofy, and Jiminy uses it to examine the contents of Jiminy's journal. When Donald, Mickey, Goofy and Pete were sucked into the datascape, Chip and Dale remain behind and try to contact them, but are blocked by the signals. Assigned by Yen Sid, Chip and Dale have been analyzing Ansem's Code received from Ansem the Wise in hopes of finding a clue that could help with retrieving Terra's, Aqua's, and Ventus's lost hearts. Chip and Dale invent the Gummiphone using Gummi Blocks and gives one to Sora and Ienzo. Chip and Dale are small anthropomorphized chipmunks. In Kingdom Hearts II, they are small enough to be covered by the "Talk" reaction command prompt. The duo are similar in appearance, though with several small differences. Chip has brown fur over most of his body, excluding the fur on his face, neck, the front of his belly, and around his eyes, which is buff-colored. He has triangular ears on top of his head, a white mouth, and a black nose. Chip has three toes on each foot and four fingers on each hand. He wears seal brown gloves, each with a gold, horizontal line near the bottom. 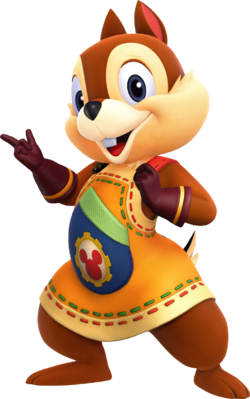 Chip also wears an apron of sorts with red shoulder straps secured to black buttons, while the apron itself is yellow with an outline of the same color as his fur. The yellow section sports green stitching lining the edge, and the other section has brown stitching. There is a slanted, blue pocket on the front of the apron with a red Mickey symbol surrounded by a yellow gear. He also has two teeth, set together, in the center of his upper jaw. Dale shares most of his physical features with his brother, but he has two, bucked teeth in his top jaw, a larger, red nose, slightly lighter-colored fur, and, in Kingdom Hearts Birth by Sleep, a mohawk-like crest of fur on the top of his head. Unlike Chip's ears, which face roughly forward, Dale's point in opposite directions, to the left and right. 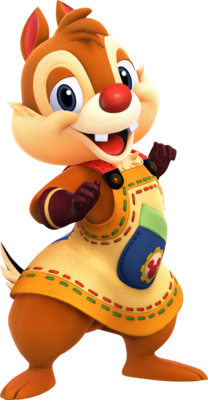 His gloves are also a lighter shade than Chip's, and his apron has the inverse color scheme of Chip's; that is, the yellow section on Dale's apron is buff-colored, and vice-versa, the same being true for the two different stitching colors on the apron. Chip and Dale first appeared in an animated short called Private Pluto. In the short, Pluto acted as a guard dog who protected a pillbox only until the two chipmunks tormented Pluto and caused a classic war of wit. The two chipmunks also became famous for antagonizing Donald Duck in other cartoons from the late '40s to the mid '50s. In 1989, they returned to star in their own spin-off TV series called Chip 'n Dale's Rescue Rangers, where they ran a detective team accompanied by newly created characters Gadget Hackwrench, Monterey Jack, and Zipper. This page was last edited on 13 April 2019, at 19:08.